KALKI Fashion consolidates its evolution in design, launched their much awaited coveted couture collection of the season, Bride & Baraat 2018, at the Flagship store, Santacruz that commenced on 11th August, 2018. The brand cordially invited the Media to be the part of this exclusive private preview. The collection was unveiled by the stunning Bollywood star; Kriti Kharbanda. The beautiful actress was invited to grace the exclusive gathering for the big unveil. 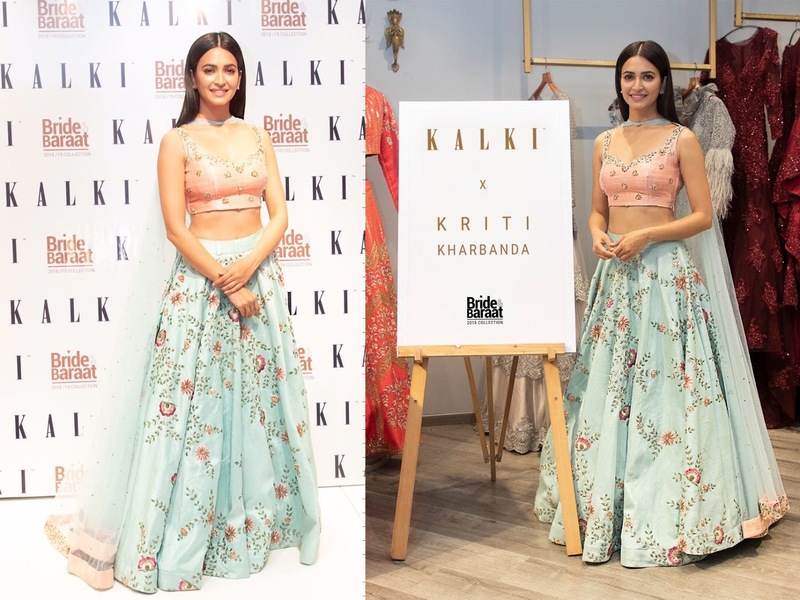 The actress was seen inaugurating the collection by proudly flaunting KALKI Fashion’s elegant outfit from the ‘Colors of Tranquilly’ range of the Bride & Baraat Collection. It is inspired by the palette of harmonious hues in baby blues and green yellows, added more spark to her beautiful persona. Actress Kriti Kharbanda’s drool worthy amalgam made a swarming impact at the preview. Kriti said she admired KALKI Fashion’s Bride & Baraat Collection and the fact that they are the perfect fusion of vintage and modern style. “I felt amazing. The Bride & Baraat Collection has perfect mix of fairytale and royalty vibes not only for the bride but for the bridesmaid, bride’s mother, sister which is commendable. I am head over heels in love with the intricate designs and how these ensembles narrate a unique story,’’ said the actress when asked about KALKI Fashion’s Bride and Baraat Collection. 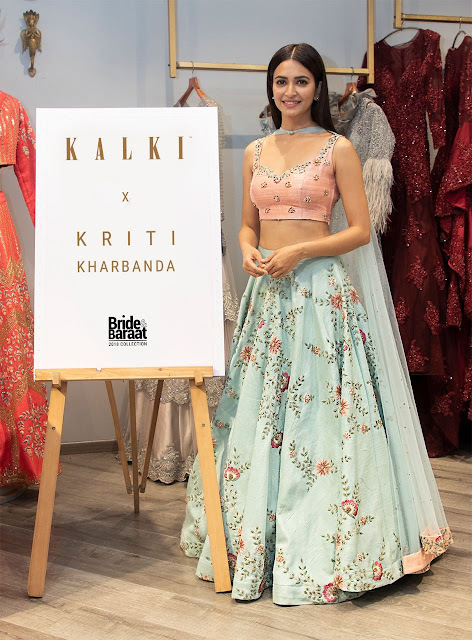 One of the designers at KALKI, Mr. Nishit Gupta says, ‘‘We are happy to have Kriti Kharbanda with us for our exclusive preview of Bride and Baraat 2018. Her charm and persona is an add on to our grandeur collection. Hope people love our special edition of bridal collection as much as Kriti did ’’. A handpicked collection with an amalgamation of a variety of rich fabrics, magical bounties that render the ensembles that are perfect for the dreamy wedding. This splendid creation by KALKI Fashion is crafted from the finest materials, surface ornamentation, and an aesthetic sensibility to rediscover the experience of wedding fashion. Inspired by the regal origins & concepts, KALKI Fashion’s new range uncovers luxury bridal wear with a mix of international appeal and Indian grace.